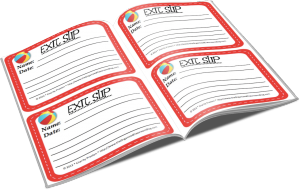 Classroom Freebies Too: FREE Exit Slips! Exit slips are a little strategy that we don’t always think of, but they can be so helpful in doing a quick check of student understanding. You can use exit slips on a regular basis to check for understanding from a lesson you just taught, random review skill checks, or even a little preassessment for the next day’s lesson to adjust plans accordingly. Want your own free set of Exit Slips?